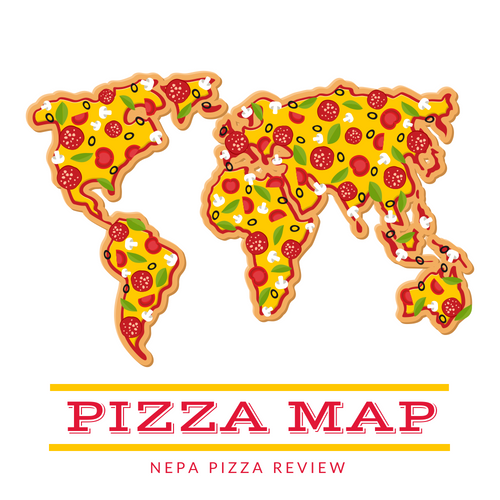 Here at the NEPA Pizza Review, I try to review the pizzas that my readers want me to review. 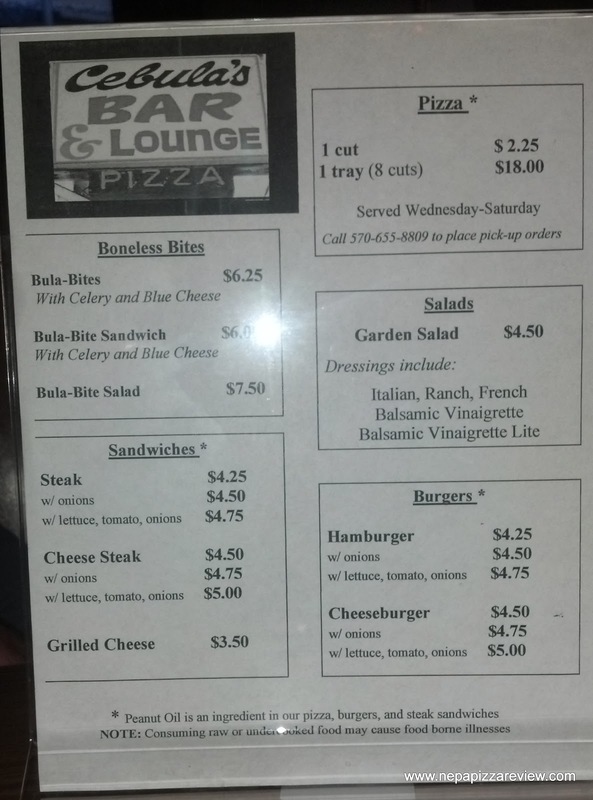 I've gotten quite a few suggestions to head to Cebula's Pizza in Dupont lately, so I knew I had to give the NEPA Nation what they wanted! The thing that really attracted me about Cebula's was that everyone said it was really different. If there's a unique pizza I haven't yet had, you better believe it's going to be a priority for me to try it! My sense of direction is horrible, and I had no idea where I was going, so I once again enlisted the services of my buddy who knows the pizza scene in that area. We hopped in the pizza mobile and headed for Dupont. The place was actually really easy to find, it's a small place directly on the Main Street in Dupont. Even I couldn't miss it! When we got out of the car, we were a little confused as to which door to walk in. 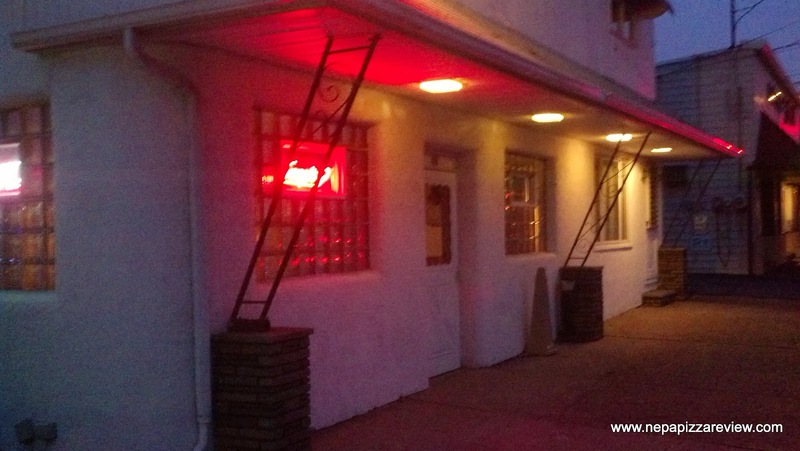 At first I poked my head in the door on the street side of the building, and that appeared to be just a bar, so I hesitated and looked around the other side of the building to try another door. Luckily, this door (on the parking lot side) led us directly into the dining room which had about 7 or 8 tables. There's no question that the place has been here forever as the booths looked to be there since the 70's, but to me it really added to the ambiance of the place. In the age of chain restaurants and everything being so modern, it was cool to have a blast from the past like Cebula's. The place appeared to be clean so we didn't think twice about dining here. 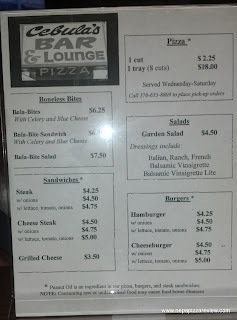 We took a look at the menu, and of course we went right for the pizza which is sold by the slice, or by the "tray." The $18.00 for an 8 cut of pizza was a little steep, but I've seen this high price tag on pizzas in this area of NEPA before - in the form of a Pan Fried Sicilian. I fully expected to get 8 very thick, deep fried slices of pizza, but I was surprised to see something completely different when the courteous and efficient waitress brought it out. What we received was not a deep fried Sicilian, but something that resembled an Old Forge pizza. The crust was semi-thick, like an Old Forge, and it was covered with a blend of cheeses which included a cheddar of some kind. 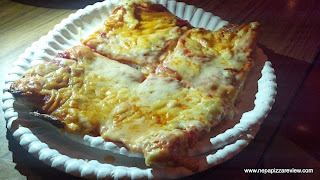 The crust was not uniform in shape like an old forge pizza, so I wasn't quite sure what to call it! It was sort of rectangular, but it clearly was not! So it was time for the first bite, and this is where things really changed for me. The crust was definitely unlike any crust I have had in a pizzeria before. It was not thick or fluffy, rather it was pretty dense, and had the texture of a premade pizza shell. After trying a few bites, I concluded that this was not a premade shell, but it didn't quite seem like fresh dough either. (CORRECTION: After talking to a friend of the owner, I am clearly wrong on the fresh dough, and Pillsbury comments, so use my comments as a comparison for texture and flavor. I am told the dough is made fresh on-site daily!) 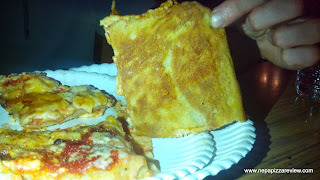 So I went back in my pizza making mind, and recalled the time that I made pizza from a canned Pillsbury Pizza Dough. It tasted exactly like the Pillsbury stuff, so my guess is that they are using something similar. The sauce was very tasty, well balanced, and very flavorful. The cheese was generously piled on top, and was also very tasty. The whole pizza was truly delicious, but confusing to me. It seemed so simple, so easy, so common sense - but no one else thought of this pizza, and Cebula's seems to be the only one smart enough to make it! 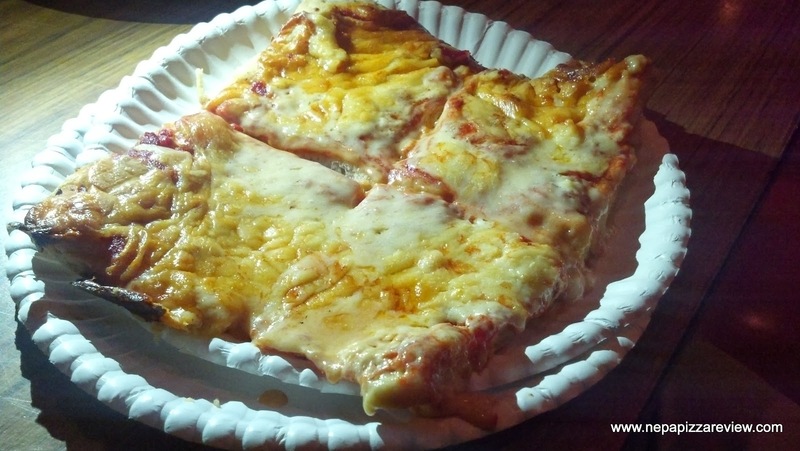 Check out what the Keystone Pizza Critic has to say about Cebula's! I have to say, usually the hallmark of a great pizza is the freshest dough which has a diverse bubble pattern, nice charring, high-end tomatoes, and a quality cheese. This pizza had none of that, but I was truly impressed. I guess the moral of the story is that keeping it simple can be just as good as being fancy. So kudos to Cebula's for churning out a quality pizza, and thanks to the readers who recommended this pizza to me!